Long before the Cupcake Crusaders had this blog, we had dreams about what it might become. A place to share our love, stories, thoughts, and photos of cupcakes. 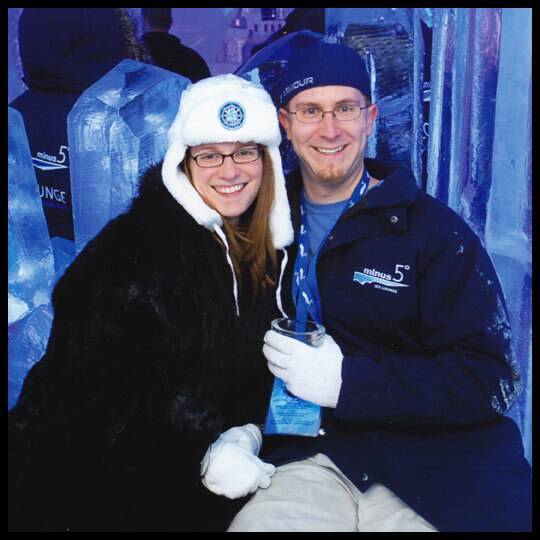 Almost a year before our blog began, in August of 2010, my husband and I went to Las Vegas as a last hoorah before taking the plunge into parenthood. Prior to leaving, I did plenty of research to find cupcakes while on vacation. After finding out that the hotel-casino we were staying in had a cupcakery IN it, I knew I didn’t need to worry about going through cupcake withdrawal. 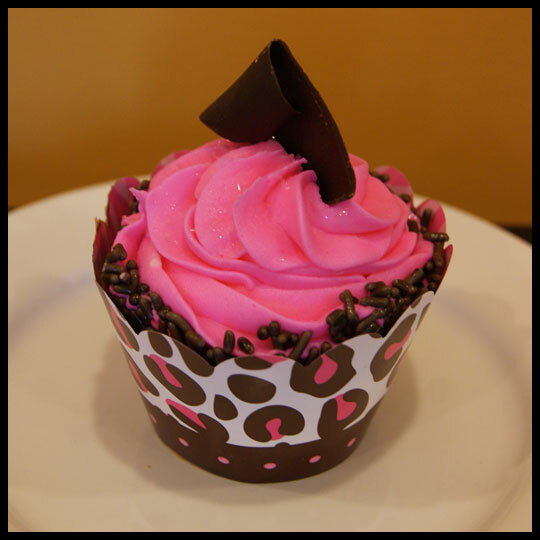 The Cupcakery has three locations in Las Vegas, The Monte Carlo being one of the long standing ones. As luck would have it, we were staying at the Monte Carlo, so before hitting the slots, “The Strip,” and the drinks, I HAD to scope out the cupcakes. It was so hard to select just a few flavors. I didn’t want to get too many, knowing we’d only be in Vegas for a few days and that I’d hopefully be collecting more cupcakes on our explorations. There was one that I did have my mind set on prior to arriving and that was the Kir Royale, a raspberry cake with champagne frosting. 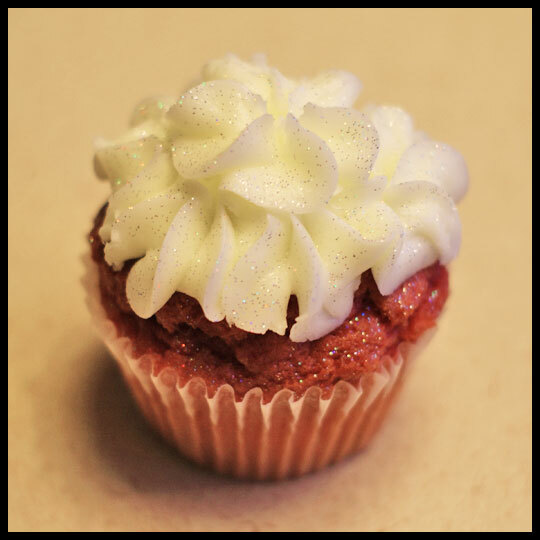 Dusted in glitter, this cupcake was made to stand out. They had a couple remaining in their display when we showed up, but my built up excitement was replaced with disappointment after tasting the overly sweet cupcake that was lacking in any hint of bubbly. At the time Dan was still my little cupcaker in training so I helped him select flavors I thought he would like. 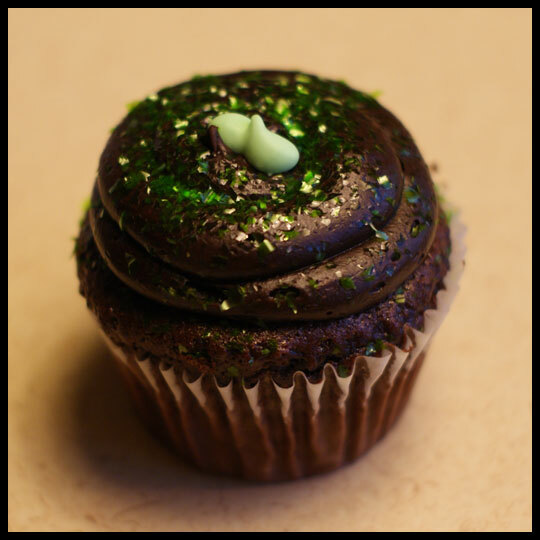 The Grasshopper was a chocolate cake with mint chocolate frosting. Just like the Kir Royale, we remember it being too sweet for our liking, which was surprising with a cupcake that has a dark ganache frosting. According to The Cupcakery’s website this is one of the original flavors and, “has gotten better by the year.” So it would be worth a second tasting to see if they are right. We saved the Mound of Joy and Boston Dream cupcakes for breakfast the next day. 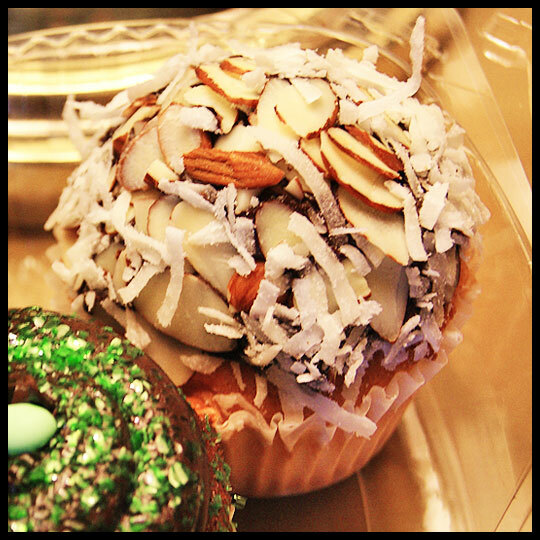 This cupcake did not skimp on toppings, with a coconut cake, chocolate buttercream frosting, and rolled in shaved almonds and coconut. Luckily it wasn’t as sweet as the cupcakes we indulged in the night before and I remember really liking it. Clearly I haven’t changed much in three years, because if I see a Boston Cream (or Boston Dream, to The Cupcakery) I have to get it. And it’s perfect for breakfast! Just like the Mound of Joy, this cupcake was not overly sweet. It is your standard Boston Cream concoction, with vanilla cake, Bavarian creme filling, and dipped in smooth chocolate ganache. Very tasty. 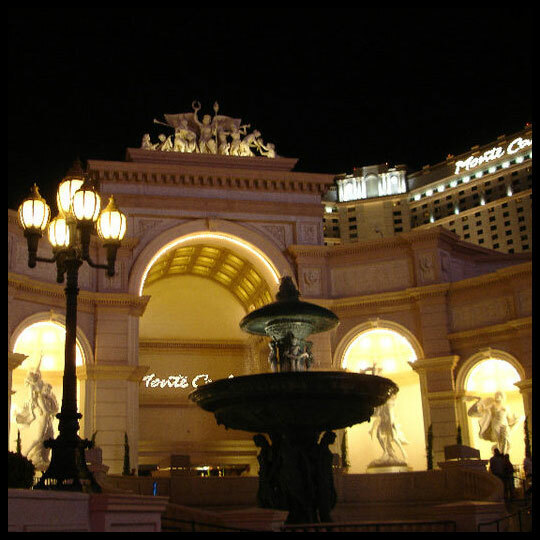 My husband and I had a lot of fun in Vegas, playing penny and nickel slots (we love the video slot machines), walking around, taking in the lights and sights, window shopping, and helping ourselves to a few cocktails. Cupcakes just made the trip that much sweeter (for me anyway). 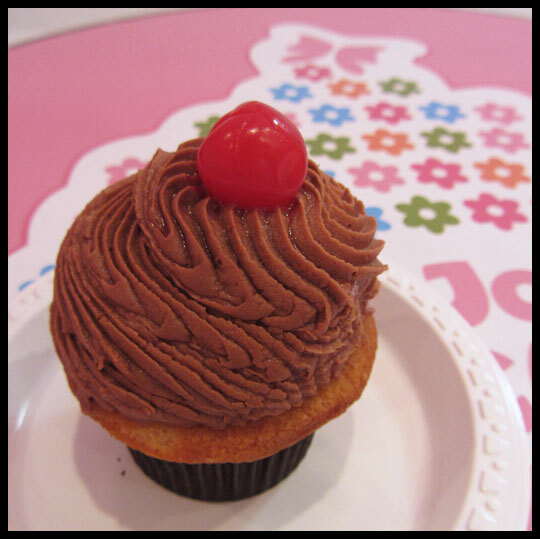 Although it’s been a few years, according to The Cupcakery’s website these cupcakes are still available (and even look the same) and they are still located in the Monte Carlo. When I get back to Vegas, I wouldn’t hesitate in trying them again since it’s been so long. Although they weren’t my favorite in Sin City, the location is very convenient. 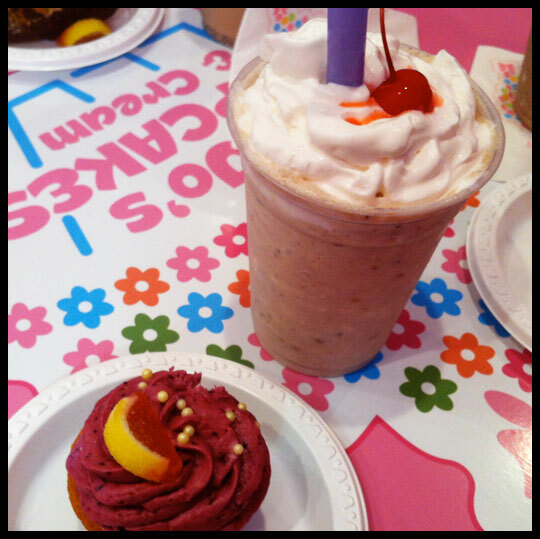 The Cupcakery was the first cupcake place we found on this trip but there were others, so look out for more to come! 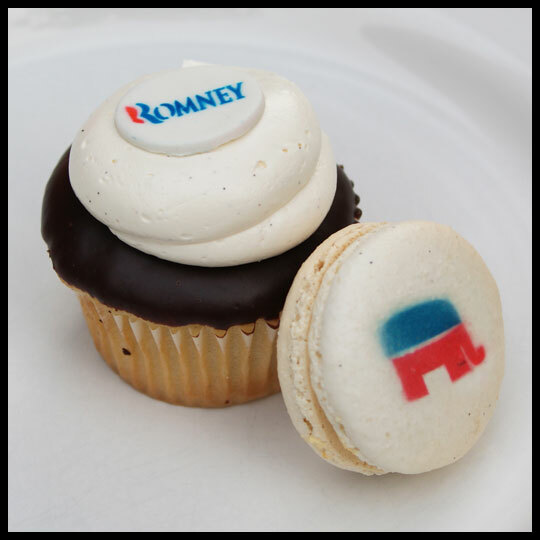 The Presidential election is around the corner and The Sweet Lobby’s cupcake and macaron polls are in full swing (you can track the results on their Facebook and Twitter pages). We had a chance to review them a few weeks ago and are now big fans of their tasty treats. The owner, Winnette McIntosh Ambrose and her brother, Timothy McIntosh, participated in Food Network’s Cupcake Wars, using their love of sweets and engineering backgrounds to win first place for The Sweet Lobby. The election is right around the corner and politics are in the air wherever one goes. Are you finding that customers are coming in specifically to place their vote? I hope they are coming in because we have the best cupcakes and macarons in town but if “voting” makes them feel better about it, that’s great! Being located so close to the center of political action, do you know if either candidate is aware of the sweet campaign you are running? Yes, they are aware of the campaign. In fact, one of the Presidential candidates actually had two Barracks Row boxes full of political macarons presented to him on his bus. 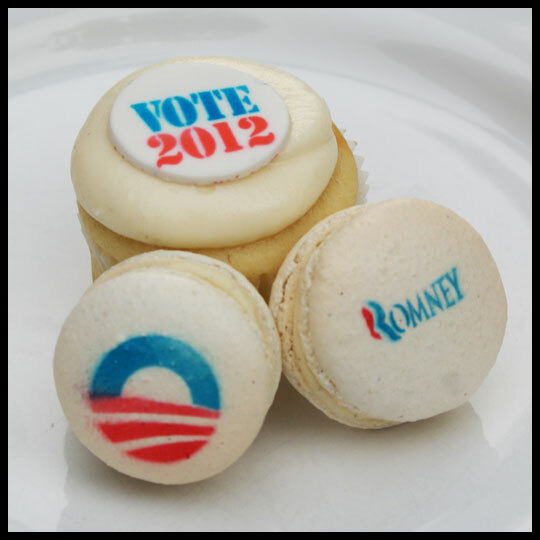 Your location seems to make The Sweet Lobby the perfect place to hold a presidential polling, sweet-tooth-style. Campaign parties must be popular around Capital Hill. Have you already seen a lot of interest in large orders for campaign parties? Most definitely! 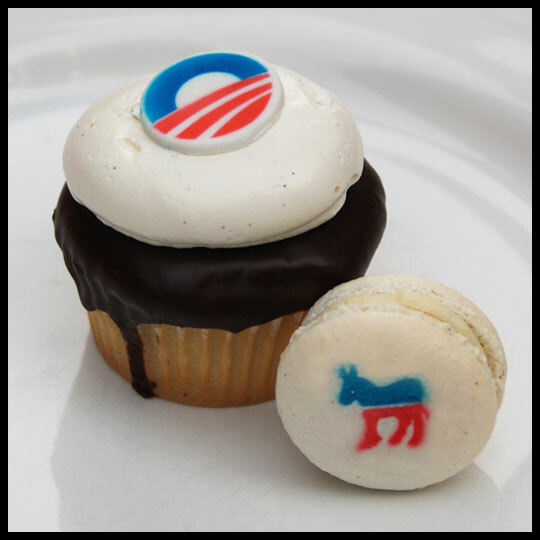 We’ve been inundated with requests for the political pastries as well as our classic desserts. When can we expect to see the Mac-Attack ads go live? 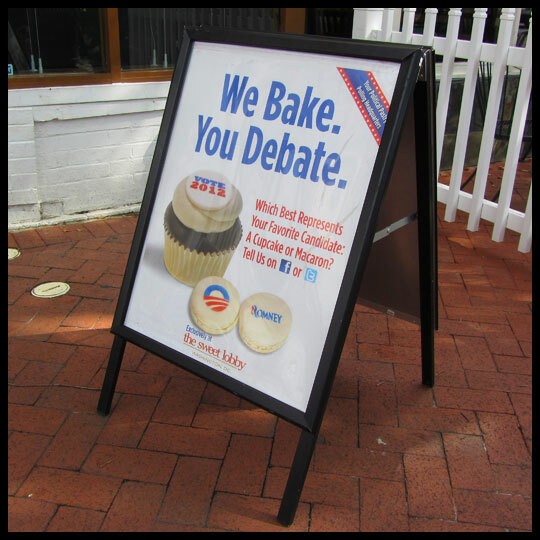 Aside from the current debate topic, “Is your candidate more like a cupcake or a macaron,” what other issues might we see brought up for debate? Our social media followers will be able to debate issues to include foreign and domestic relations ingredients, and effective ways to use sweets to boost the economy. We’ll give the Vice Presidential candidates some airtime as we debate the flavor of the VEEP. While the main agenda of this campaign is to track candidates, the Cupcake Crusaders are also curious about another poll…What is more popular in your shop, cupcakes or macarons? As an All-American indulgence, the cupcake embodies the irresistible combination of childhood nostalgia and undeniable appeal of a “made just for me” individual dessert that, at some level, is easy to make. On the other-hand, the macaron is a more delicate dessert that’s difficult to make and easy to ruin. They’re not very forgiving, but when made well, the impression is lasting. The first bite of the lightly crisp shell, the chewy interior and the flavorful, creamy filling! 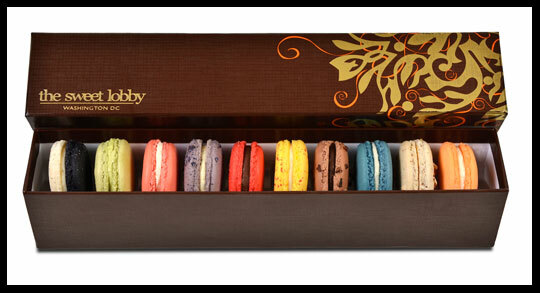 Who can deny the refined elegance coupled with fantastical whimsy of a Parisian macaron? At the end of the day, we are totally bi-partisan. We bake, you decide. 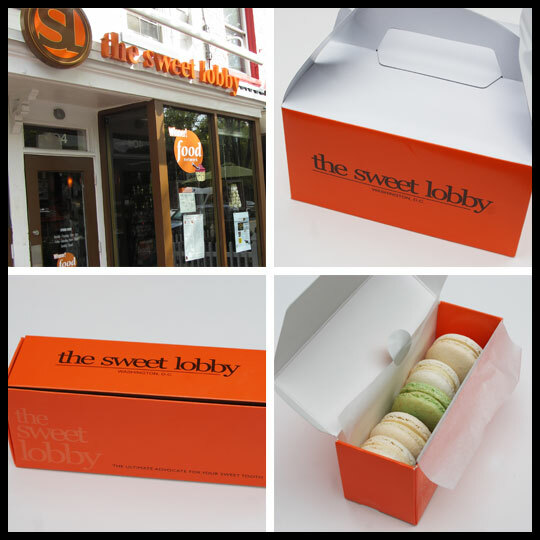 Although you sell other pastries at The Sweet Lobby, cupcakes and macarons are what you are most known for. What do you think it is about each that makes them so enjoyable? At the Sweet Lobby, we don’t take shortcuts! We prepare real buttercreams using traditional European methods, fresh fruit and ultra-premium chocolates. We pride ourselves in creating both classic and daring incarnations using the finest globally and locally sourced ingredients imaginable! In addition to cupcakes and macarons, we have several product lines including shortbread, madeleines, caneles, éclairs, loose-leaf tea, and hot chocolate. We think that our guests can truly taste the difference and appreciate the care we put into everything we offer. How do you recommend eating the MacTop cupcake? Taking the macaron off and enjoying it separately or digging right into to the whole thing? That is totally up to you! We’ve seen it all! I am personal fan of the macaron-first technique. What’s the strangest or most unique order you’ve created in your Cupcake Lab? Right now, we are working on a trio of beer inspired cupcakes for a craft beer themed wedding. When you appeared on the Chinese New Year episode of Cupcake Wars and had to select at least 3 of the 12 exotic flavors, were you at all nervous that selecting 5 would be too much? Not at all. I’m from Trinidad and Tobago, which is very culturally diverse, so all of those ingredients were very familiar to me. As an engineer/scientist, I am comfortable thinking on my feet and I understand how to combine flavors. What did you take from your experience on Cupcake Wars (aside from the first place prize!)? Cupcake Wars highlighted the importance of balancing some of the most key ingredients in food service: quality, presentation and delivery. Cupcake Wars is known to have previous contestants return. Would you consider going back to battle again? Of course! In addition to Cupcake Wars, we had the honor of participating on Cupcake Champions this past May. We welcome any new opportunities to return to television! 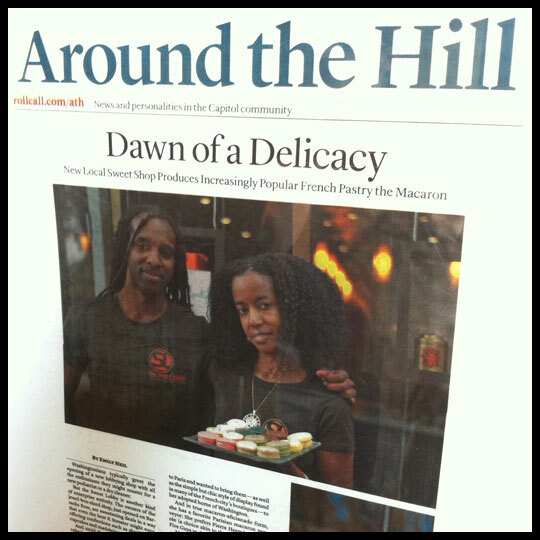 If you aren’t in the DC area and are now craving a perfect little pastry from The Sweet Lobby, no need to worry. They are offering nationwide shipping next month! You can find out more by visiting their website. We’d like to thank The Sweet Lobby for taking time to answer our questions. Their Cupcake Wars win was well deserved and we appreciate what they are doing to get people excited about the election and getting out to vote. 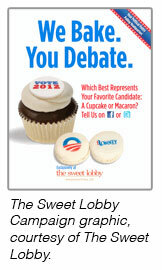 The location of The Sweet Lobby makes it the perfect business to promote voting, while engaging our sweet tooth. We love that they are doing something to get people excited about the election. 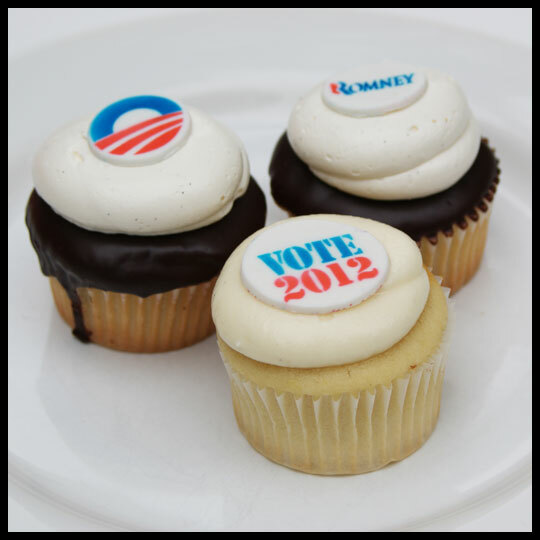 They also offer generic “Vote 2012” confections and are participating in Get Out The Vote initiatives, including providing voter registration information. Crusaders Stacy, Elisa, and myself decided spend the afternoon in DC together after The Sweet Lobby invited us to sample some of their campaign cupcakes and macarons. Although one of our friends, Guest Crusader Kristina, has visited the shop and had a lot of good things to say in her review, it was our first time there and our inner design geeks were in heaven. The branding features clean design, with a look that is consistent throughout the packaging, storefront signage, and interior design. Not to mention their creative custom boxes, which fit the products perfectly and allow for easy and safe travel. Once we started eying up the selection, we couldn’t help but take more home with us than planned. In addition to Boston Cream and Lemon Cream election cupcakes and presidential macaroons gifted to us, we also took home a seasonal Caramel Apple cupcake, a Chocolate Raspberry MacTop, and a few extra macarons. If the selection of cupcakes and macarons isn’t enough (and it is! ), they also offer their own line of shortcakes and tea. 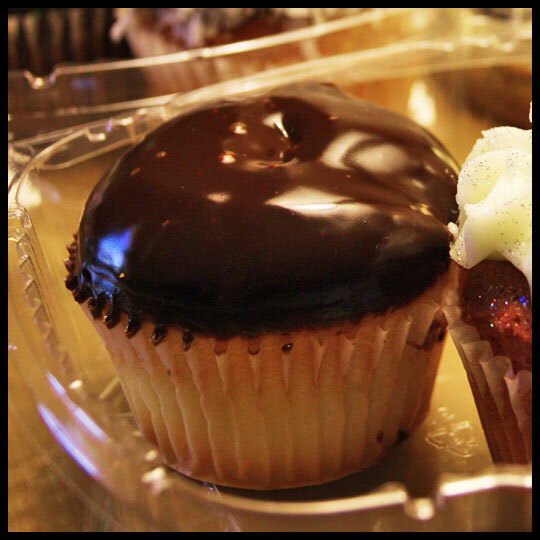 The Boston Cream cupcake seen in the photos above is a vanilla cake filled with pastry cream, dipped in chocolate ganache and topped with whipped vanilla frosting. 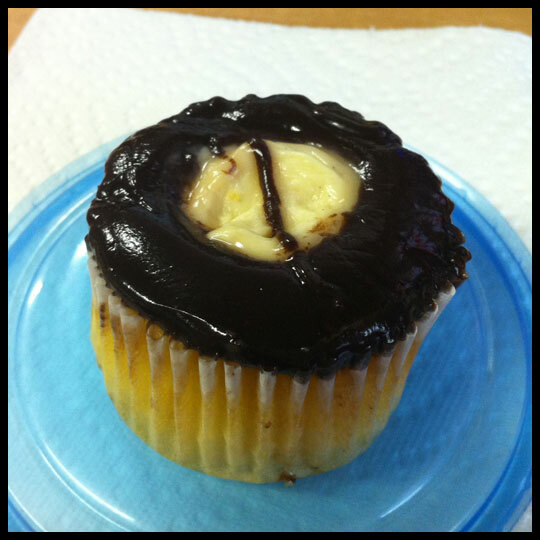 This is one of the best Boston Cream cupcakes I’ve had. The cake is on the denser side, but since the frosting is light it’s the perfect balance. Not too sweet, not too buttery, not too savory…my mouth was happy. The cupcake had the perfect amount of tartness mixed with sweet. Just like the Boston Cream, the vanilla cake was on the denser side, but moist, then filled with lemon cream and topped with whipped lemon frosting. 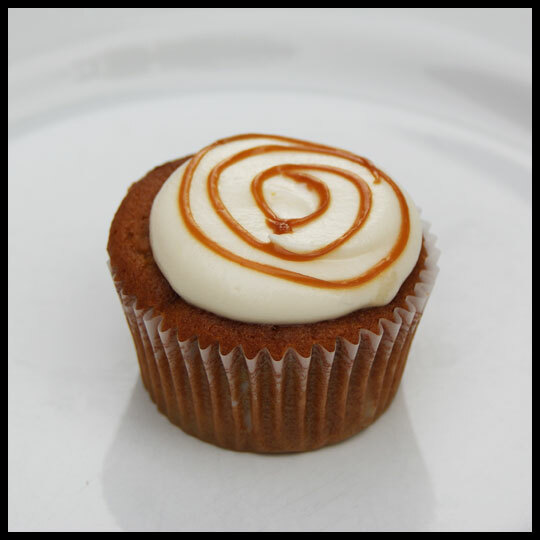 This cupcake had a caramel apple cake with cream cheese frosting, drizzled with caramel. The cake was dense but very moist and contained fresh apples with a subtle caramel flavor (which I liked because otherwise it can make the cupcake too sweet). I felt like the cream cheese frosting overpowered the cake, however since it was so tasty I’d still go back for more. Wow. Chocolate Raspberry is one of my all time favorite combinations and this was no exception. At first I wasn’t sure what to expect because the frosting appeared to be milk chocolate, which I’m not really a fan of, but it surprisingly complemented the dark chocolate ganache and moist, fudgy cake very well. The mini macaron on top was, of course, perfect. Nice and tart, the way raspberry anything should be. The cupcake portion seemed to have some kind of subtle raspberry flavor, but there was no filling so I’m not entirely sure if the chocolate cake was flavored with raspberries or if it was the lingering aftertaste of the macaron. 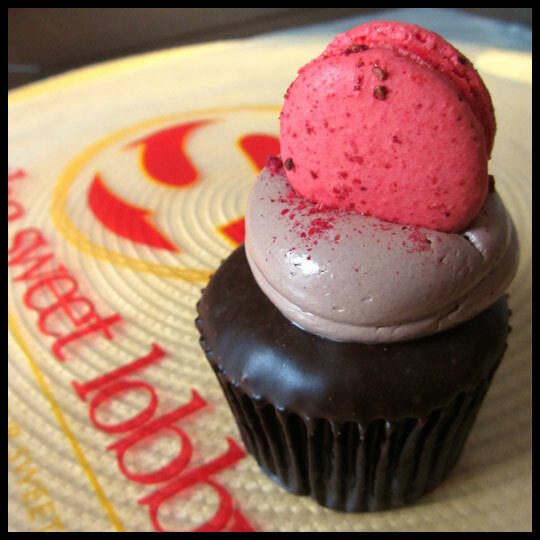 The cupcake and macaron combined resulted in a wonderfully decadent treat. 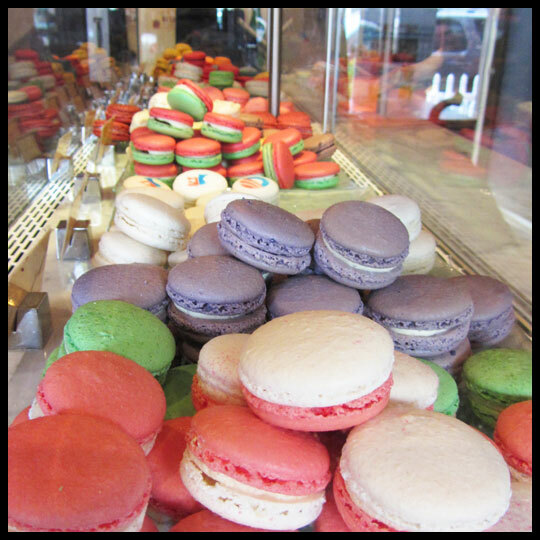 There’s no denying that when it comes to macarons, The Sweet Lobby knows what they are doing. 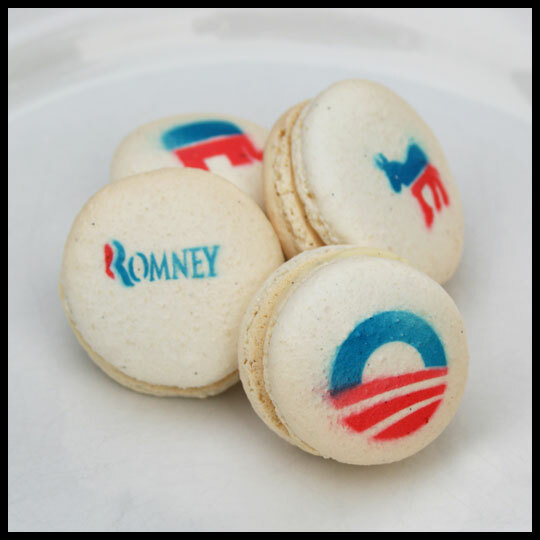 Their election macarons are named the Obamamac and Romneymac. They appear to be plain, however they consist of almond meringue shells filled with premium Belgian white chocolate ganache infused with vanilla beans from Madagascar and Tahiti. The only way to describe it is delicious. We all really loved the selections we picked, which ranged from simple to complex in flavor combinations. Crusader Stacy said she couldn’t put her Sweet Potato Pecan down and Elisa was very enthusiastic about the Strawberry Basil. I tried the Olive Oil Walnut Pecorino, which came recommended. Although it sounds strange, the olive oil complemented the walnut well. When you stop by The Sweet Lobby you’ll have a lot to think about. Obamamac or Romneymac? 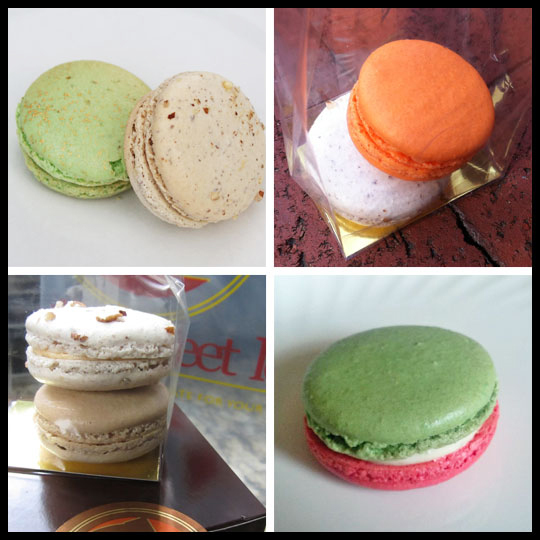 Cupcake, macaron, or MacTop? And that’s before you even decide on a flavor. But whatever sweet treat you choose, your taste buds won’t be disappointed. We’ll have an interview with The Sweet Lobby for you soon, so keep a lookout for it! *We were lucky to be gifted some of our treats, but, as ever, this review reflects our honest opinion. We will gladly patronize The Sweet Lobby in the future and we are happy that we purchased some additional treats to share our thoughts on as well. Some of you may remember the bad storms that barraged the east coast a couple of weeks ago, leaving many of us, including Crusader Stacy, without power for days. During this time, one of our guest crusaders, Jen, was visiting for the weekend. We had planned on spending the afternoon in Annapolis, hometown for Crusader Stacy and Jenn, and wanted to visit Sweet Hearts Patisserie. I found out on Facebook that morning that they were partially without power and would not be serving fresh baked cupcakes that day, since their ovens were not operating. Instead of surprising them while they were at a low, we decided we would cut them some slack and plan a visit for another day. Bummed, we were at least glad that my dad still had power, and he and my step-mom would be able to venture out with us. Downtown Annapolis was booming! Main Street was full of people, trying to get out of their powerless homes. It was a hot weekend and most people had no other choice but to eat out, with refrigerators and stoves out for the count. Not to mention the excuse to sit in an air-conditioned building. I called Chick ‘n Ruths that morning to make sure they had power, but when we arrived the line ran down the sidewalk. Another change of plans in our day lead us to 49 West, a coffeehouse, wine bar, and gallery on West Street, near Church Circle. They had tables available (apparently their morning rush had finally ended) so we found a spot in the cozy front dining room and perused the menu. Jen and I were happy to see that they serve breakfast late on weekends. So, we got some breakfast sandwiches while Crusader Stacy and our step-mom got a veggie sandwich. 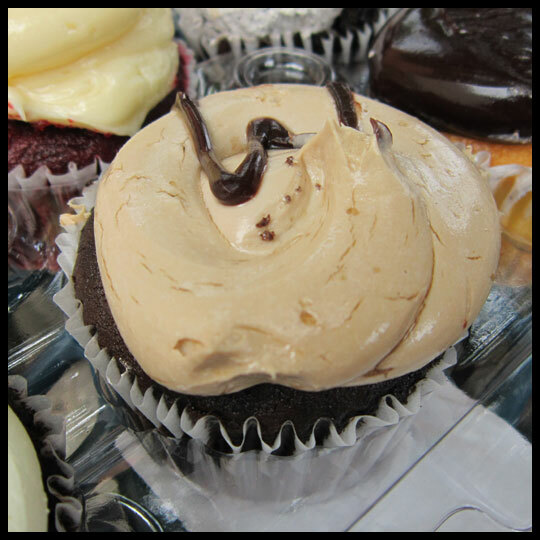 I know this is a cupcake blog, so you are probably wondering why I’m going on about 49 West, but it’s because I really recommend it. Great service, good food, and a quaint atmosphere…you really can’t ask for more while in Annapolis. And my step-mom swears that the veggie sandwich was the best she’s ever had in her life. She’s still talking about how good it was. 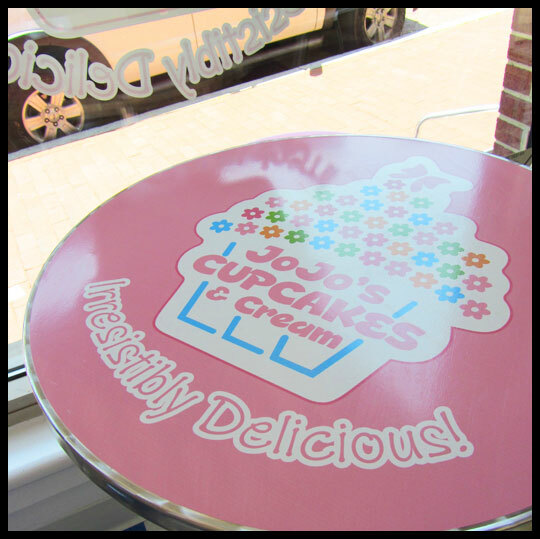 While strolling along Main Street we noticed that JoJo’s Cupcakes & Cream was open for business and in the same building that Nostalgia Cupcakes (now The Cake Courtesan in Bowie, MD) used to be located. We REALLY miss Nostalgia. 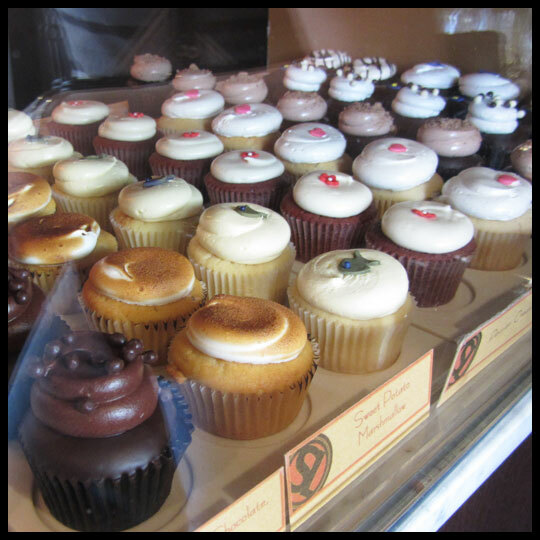 Although you can get the same great cupcakes at their new store, the location isn’t as convenient for us anymore so we haven’t had the chance to check them out yet (but we will!). The benefit that JoJo’s has in this building is that they not only have the back space that used to be Nostalgia (and is now their party room), but they also have the street-front store, with windows and signage that can’t be missed. This JoJo’s location also offers ice cream which is a nice feature, particularly since Annapolis’s tourist months are during the summer, and the locals don’t mind some ice cream in the winter. 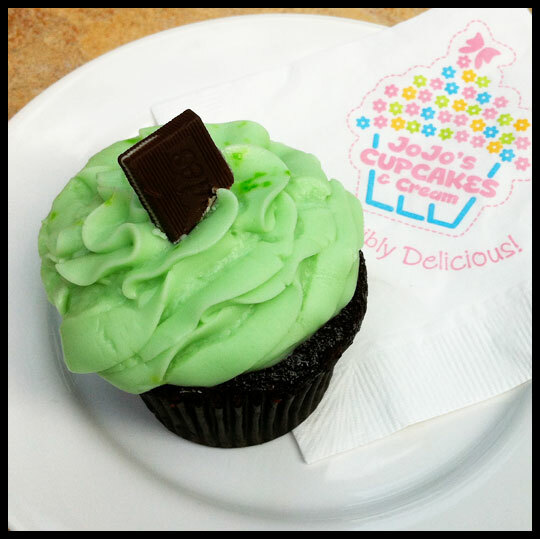 We had an opportunity to sample JoJo’s cupcakes around Christmas time, back when they had a kiosk in the Annapolis Mall. Anyone remember the missing cupcake mystery? I think we all agreed that the cupcakes we had this day were a tad too sweet for us, mostly due to the very sweet icing that was piled high. Considering our previous review, this might have to do with quality control. It seemed as if more confectioner’s sugar was used at this location then the cupcakes we had before. One thing they did all have in common was moist, flavorful cake. Crusader Stacy and I both got this lemon cupcake with blueberry lemon buttercream frosting. Looking at the frosting, we thought it would be packed with blueberry flavor, however the lemon and sugar overpowered it, and in the end it tasted like it was just a lemon cupcake. Guest Crusader Jen and my step-mom both got this cupcake. While Jen felt that the banana flavor was lacking, my step-mom thought it was subtle, but still present. They also felt the icing was too sweet. When I was asking about ice cream and milkshakes I was told that they were out of bananas that day. I wonder if the frosting is supposed to pack more banana flavor? True to his nature, my dad stuck with his usual favorite and ordered the Boston Cream. There was just one BIG thing missing from this one…the cream! 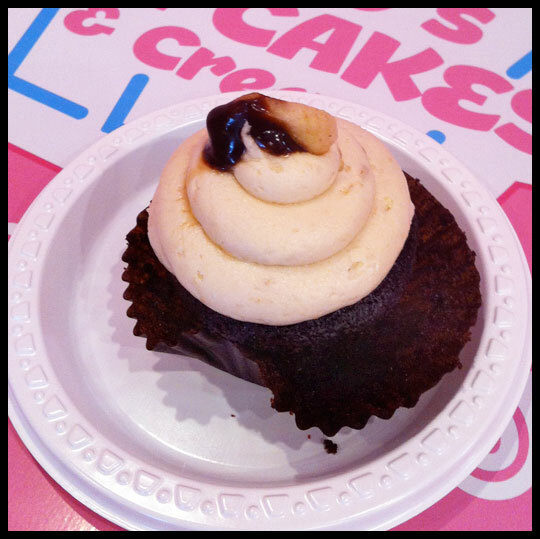 This boggled our minds because without the cream, it’s just a vanilla cupcake with chocolate buttercream frosting. 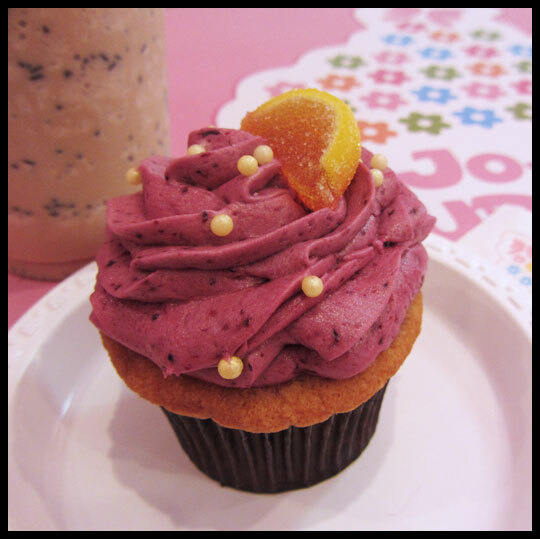 I did some research and found out from JoJo’s website that this cupcake is supposed to have a vanilla pudding filling. What happened, JoJo’s of Annapolis?! Because the cupcakes looked so good, I decided to take a couple home for my husband. I got two of his favorites, Mint Chocolate and Key Lime. While the frosting on this cupcake was sweet like the others, the mint flavor balanced it out well, making this one of my favorites. 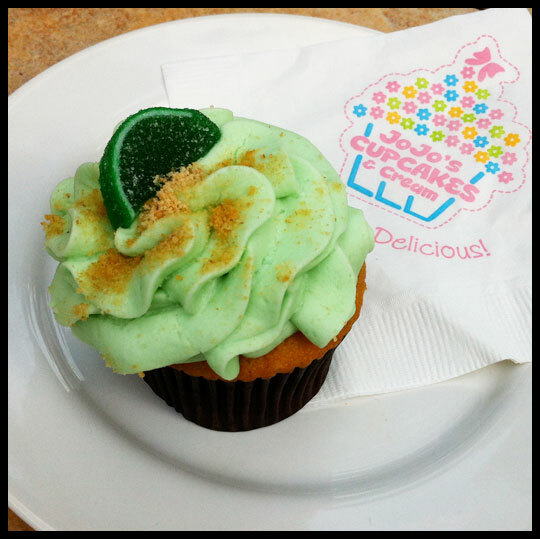 Another usual favorite, this cupcake had good tartness but was still a little sweeter than I like in a Key Lime cupcake, although it didn’t seem as sweet as some of the other JoJo’s selections. Since the day was so hot, Crusader Stacy, Jen, and I also got milkshakes to go along with our cupcakes. The choices were endless! You can make a milkshake out of any of their ice cream flavors and there are a lot to choose from. Each of our milkshakes was really good and we happily sipped them while walking around the harbor. If you find yourself in Annapolis, I would suggest going to this JoJo’s location for the ice cream and milkshakes. Then if the cupcakes tempt you (which I think they might!) share one with a friend, because there is enough sweetness to go around. The Crusaders’ Dad claims that he doesn’t have the same “gourmet tastes buds” as his daughters and swears by cupcakes he found at his local Giant store in Annapolis, MD. They are convenient and (with no better way to say it) CHEAP! Giant sells their custom flavors for only $0.99 each! Most of us are used to the run-of-the-mill grocery store cupcakes that come pre-packed in 6 or 12, with only chocolate and vanilla to choose from, and usually topped with overly sweet frosting, brightly colored and with sprinkles. However it’s becoming more popular for grocery stores to steer away from these and offer more custom confections (whether good or bad), as we’ve seen with Safeway and Fresh & Green. Our dad has been going into Giant to get, primarily, their Coconut Cream and Boston Cream cupcakes. After going on many, many cupcake crusades with us, he still can’t believe they only cost $0.99. And, after seeing his cupcaking in action, we trust his opinion. So when he told us we had to try them, we said, “Bring ‘em on!” It was decided that he would bring some to our next gathering that didn’t already have cupcakes pre-planned into the mix. That time finally came during a family trip to the Maryland Science Center. It was a beautiful day, so after exploring the Science Center, we found a table outside by the harbor to dig in. Unfortunately when my dad went into the Giant that morning, they didn’t have a Boston Cream. They did have his other favorite, the Coconut Cream, so he bought that plus 5 others for us to try. The cake on this cupcake was a little dry, but the ganache frosting was delicious. It was more like what you’d find on a doughnut…gooey and rich! The chocolate ganache redeemed this cupcake, and there was a lot of it! We thought starting with a vanilla cupcake was smart, but the richness made me wish I had a glass of milk to go along with it! My dad was a little disappointed that we found the cake dry. After raving about the cupcakes, he could only surmise that these hadn’t been baked fresh that day since he was there so early in the morning. 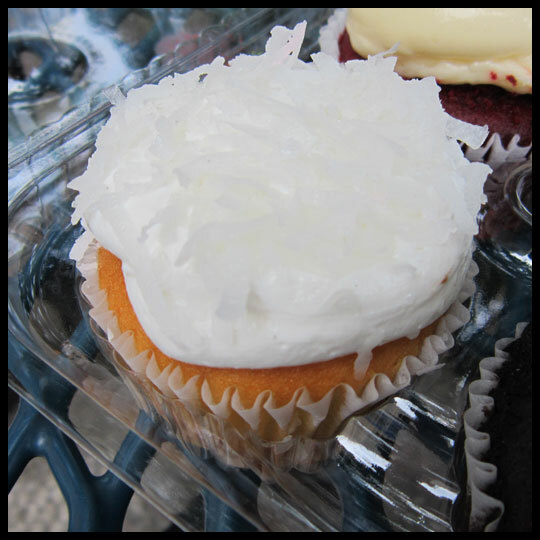 This cupcake had a vanilla cake, with whipped vanilla frosting, topped with shredded coconut. Crusader Stacy and I felt this cupcake could have used more coconut flavor, but keeping the price in mind, can see why it’s one of our dad’s Giant favorites. I was really surprised to see that Giant is offering a Banana Split cupcake. It’s been a popular one to see for the summer season and does show that their baker seems to be in-tuned to what’s going on in cupcake trends. 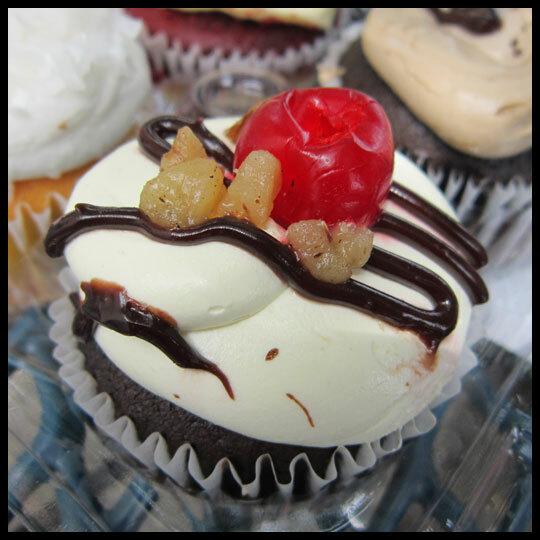 It was a chocolate cake, with banana frosting (and filling), topped with chocolate fudge, walnuts, and a maraschino cherry. Stacy remembers this being one of her favorites of the selection. 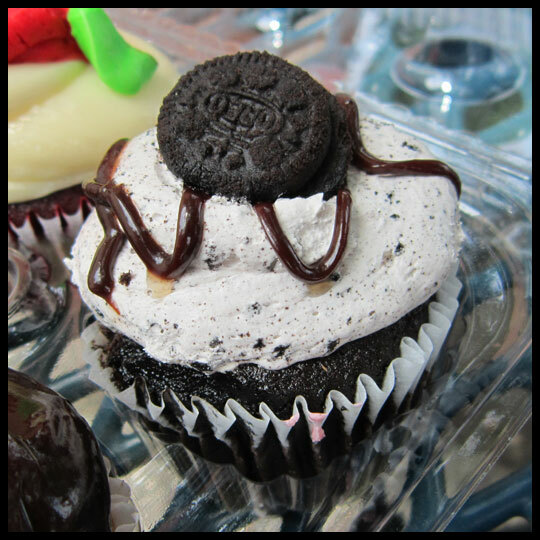 This cupcake had a dark chocolate cake with cookies and cream frosting. The cake was the best of the selection and was my favorite of the group. The frosting alone was worth the 99 cents! Crusader Stacy and I saved this cupcake for our big sis, who LOVES coffee and chocolate. I did steal a bite, and like some of the other cupcakes, the cake was on the dry side. However, there was a good coffee flavor, and despite how the frosting photographed, it was smooth and flavorful. The cake was bright red and looked beautiful, but was dry and lacked flavor. The icing was smooth, but very bland. The rose decoration on top was very sweet (since it was made with traditional sweet icing) and good, but couldn’t save this cupcake from being just mediocre. 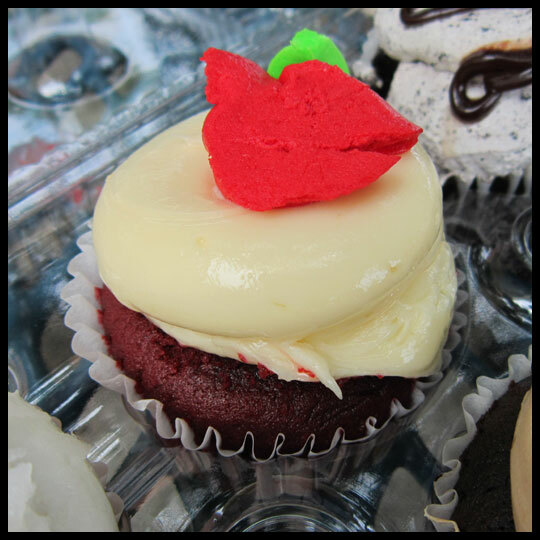 Being the “red velvet crusader” probably makes me more critical than most, so while this cupcake doesn’t make my list of great red velvets, it by far is not the worst either. 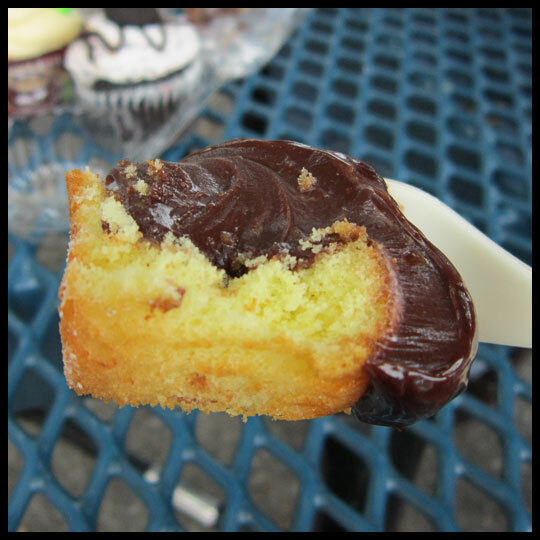 The cake was a bit spongy and lacked flavor, which I would expect from a grocery store cupcake, but the chocolate ganache had really good flavor, even if it was a bit runny, and the filling tasted just like what I would want from a Boston Cream pastry filling. The filling and ganache definitely saved this cupcake, but it was a bit of a mess to eat. 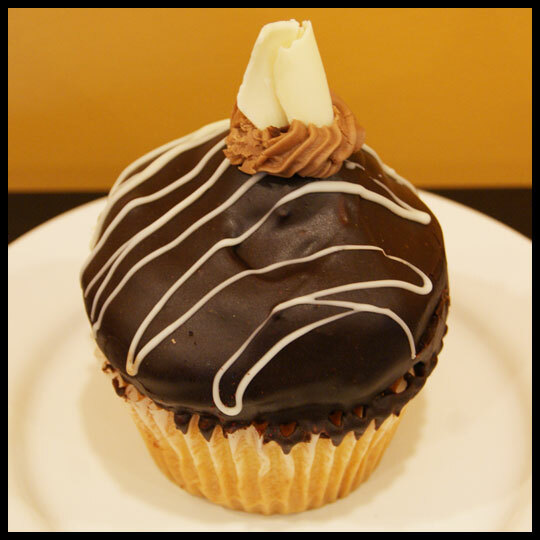 Like my dad, I’m a sucker for Boston Cream and really wish I could have tried this cupcake. From Crusader Stacy’s review, it seems to me that the frosting is very reminiscent of what you’d find on your typical Boston cream cake (or doughnut), and those are always messy to eat! Over all we feel that if you are in need of a quick, convenient, and not-too-expensive cupcake fix, but want something better then the grocery store cupcakes we usually think of, you can find that at Giant. Have any of you tried Giant’s cupcakes or any other chain grocery store’s cupcakes? What did you think? Did the lower price make you more lenient on your expectations? 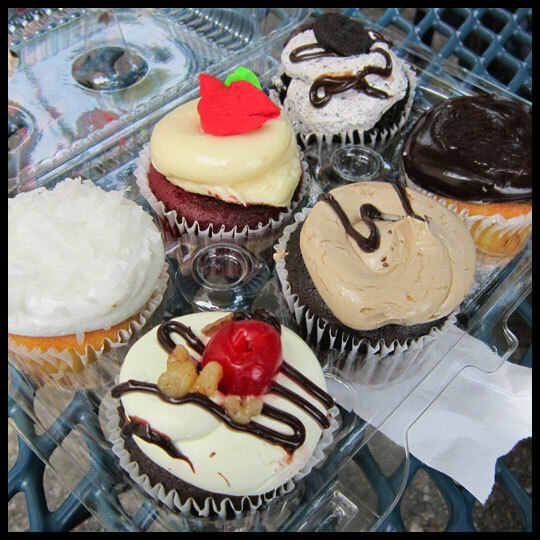 We are so excited to bring you our final thoughts for the remaining six cupcakes we tried from Snickerdoodles Bakery and Coffeehouse, since we couldn’t fit them all into one review! If Part 1 wasn’t enough to make you crave a cupcake, I think this will do it! This cupcake wasn’t ready when I first stopped in, but the owner insisted that I must try it. I was planning on grabbing lunch next door, so I told her I would be back. I’m so glad I returned! After hearing and seeing all that goes into this cupcake, it’s understandable why it takes them all morning to bake it fresh. The chocolate cake is rich and moist, the chocolate buttercream is perfection, and if those aren’t enough, it is then hand dipped in chocolate ganache! 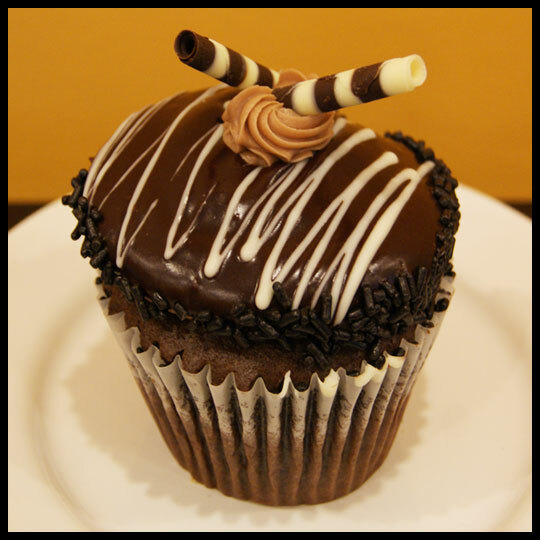 A chocolate lover couldn’t ask for anything more out of a cupcake! 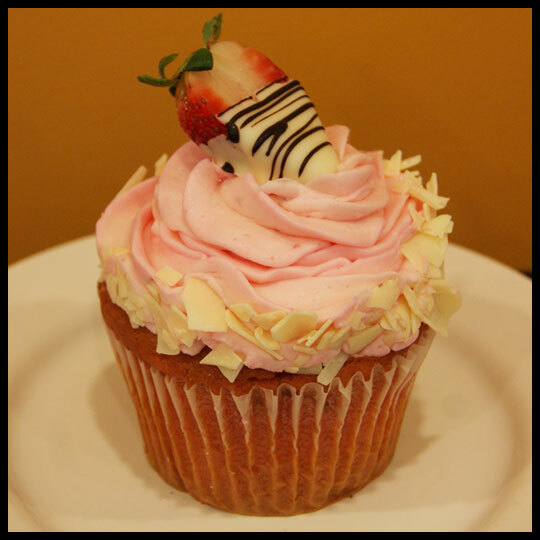 Another gorgeous cupcake that puts others to shame, this cupcake is a strawberry cake, with whipped filling, strawberry frosting, and then topped with white chocolate shavings AND a white chocolate covered strawberry! Us Crusaders are typically concerned with berry cupcakes being overly sweet, however the whipped filling tones down the sweetness and just like the others, the cake is perfectly moist. Also, eating a cupcake with a white chocolate covered strawberry just makes a girl feel special! Considering this next treat a cupcake might be a little controversial, since there is no frosting on top. However, as soon as I saw it I couldn’t wait to try it! 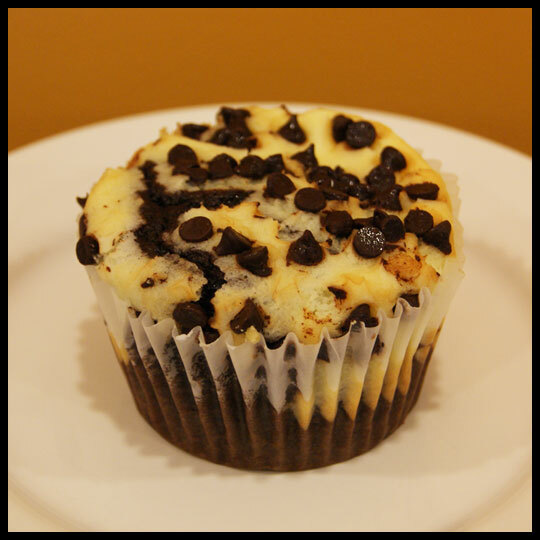 All those chocolate chips mixed in with cheesecake had my mouth watering from the start. I was so pleased by this blackbottom that if they have it on future visits, there’s no way I could leave without one. 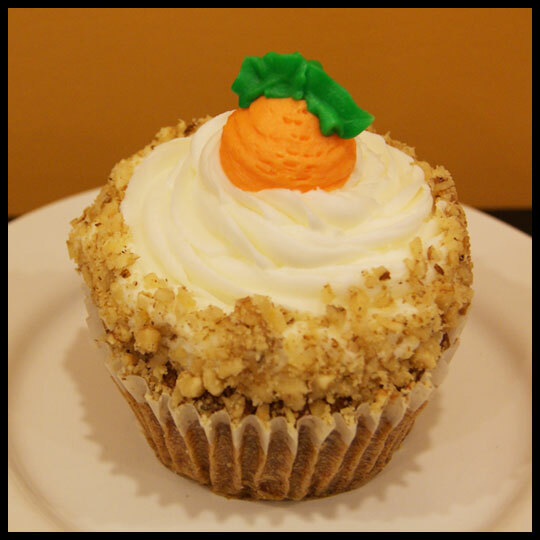 As I’ve mentioned before, carrot cake is one of my favorites. It’s a classic and, even though it’s more of a spice cake, you can find it year round. This carrot cake could possibly be one of my all-time favorites. The cake has real carrot pieces and nuts, which add a nice texture, then a cream cheese filling, with American buttercream frosting. The mixture of spice and sweet is perfect. As large as these cupcakes are, I wish I had a whole one to myself and hadn’t shared! And I usually like sharing! I love anything Boston cream. Pie, cake, doughnuts…and cupcakes are no exception. As soon as I heard this was a Boston cream, I became giddy. 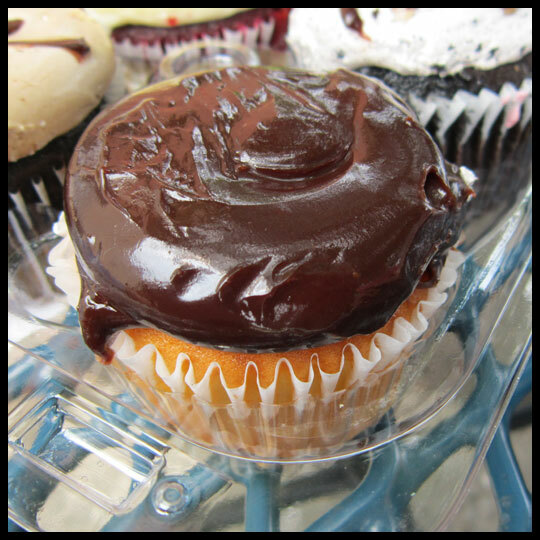 This cupcake is a vanilla cake, filled with Boston cream, and topped with chocolate buttercream and chocolate ganache. 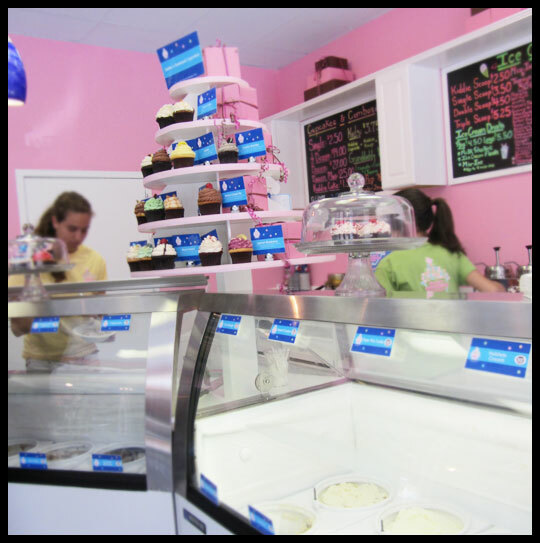 While speaking with the owner, she told me that after they put the chocolate buttercream on the cupcakes, they chill them, so that the chocolate ganache sets up properly. Normally I would only want chocolate ganache on a Boston cream treat, however their chocolate buttercream is so rich that it holds up well to the overall flavor. I secretly would have enjoyed more pastry cream, but that’s only because I could have eaten bowls of it alone! I don’t know what else to call this cupcake, but it is so much fun! This cupcake is priced at only $2.00, which I couldn’t believe. The moist vanilla cake and sweet American buttercream are reminiscent of a traditional birthday cake. Although it is an average size, unlike their other super-sized cupcakes, its decoration makes me feel like I attended a chic party. I recently stopped by Snickerdoodles, after having been impressed by their cupcakes, and tried their coffee and sugar cookies. Just like with their cupcakes, everything was perfectly tasty! Like I said in Part 1 of our review, if you have a chance to visit Snickerdoodles, please do!